Chuck’s Margarita Grill | Eat It, Damn It! I thought there were many eating options around colleges. I was wrong. MG & I went to a show at UCONN and we needed someplace to have dinner. 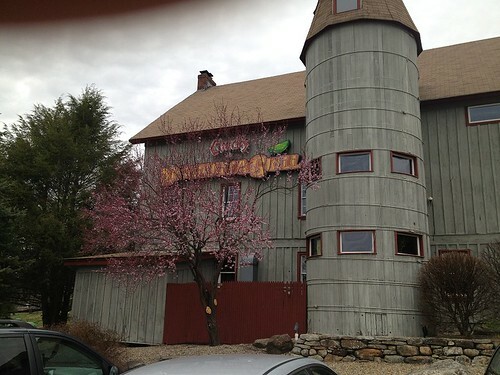 I did some searching for eateries in the immediate Storrs area. There was pizza and wings, wings and pizza, pizza, pizza, wings and wings. Seeing a pattern? This is the steakhouse menu. The more traditional menu is the Margarita Mexican food menu. 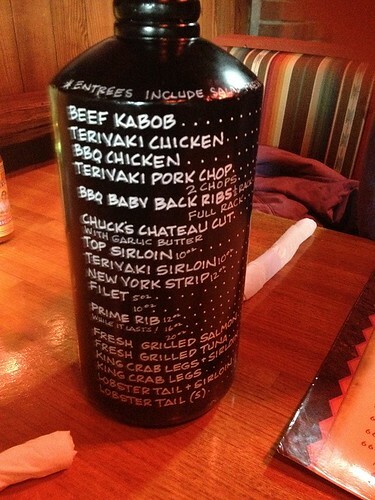 I’m not sure what the pictured menu is supposed to be: Bottle of steak sauce? Bottle of Mezcal? Bull suppository? 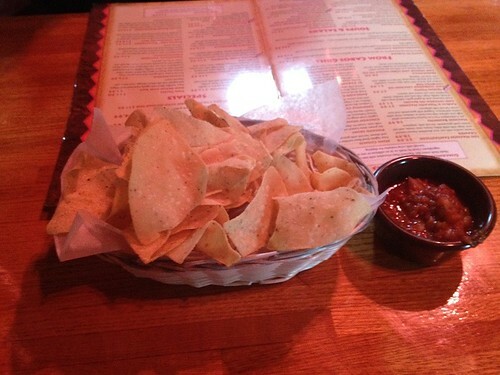 Whatever menu you are ordering from, complimentary chips and salsa are provided. Nothing special, nothing bad. 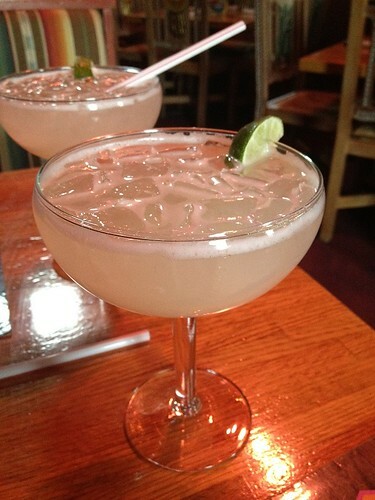 We were at a Mexican restaurant, and it was nearing MG’s birthday, so it was Margarita time. They had Milagro tequila on the menu (a plus), so things were promising. The Margaritas were good, very good in fact, but not amazing. You could do worse. MG and I both decided to forgo the steak portion of the menu and have some Mexican food. There was nothing terribly exciting or different about the offerings. They had the same options you can find at just about any Tex-Mex restaurant throughout the US: Burritos, chimichangas, tacos, fajitas, etc… there was nothing that caused an eyebrow to raise or to quicken the pulse of the adventurous eater. For appetizers, we got a couple dishes. First were the Tomato & Garlic Nachos with Bacon ($9.58). 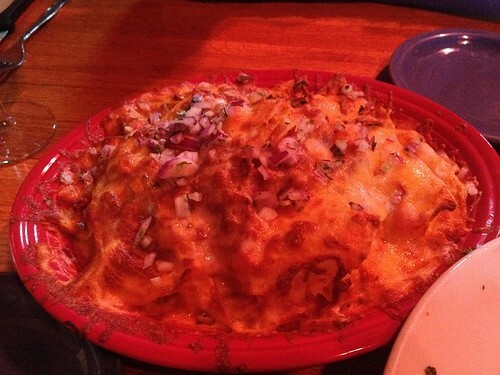 There were nachos, topped with cheese, garlic, and bacon. I know, that’s exactly what the description says. You are right, and that is what it was, nothing more. It may seem that I’m be facetious, but they tasted like a bag of nachos from the supermarket that were topped with some cheddar, some diced tomato, bacon, and some chopped garlic. It was then placed in an oven for a little while to melt the cheese. If that’s what you want, that’s what you would get. My point is that it tasted more “assembled” than “made” Perhaps I’m splitting hairs. They certainly did not skimp on the garlic. I only tried a bite. That was enough for me, but MG (who really enjoys garlic) enjoyed the dish. We also got the Chipotle Tenders ($7.59). 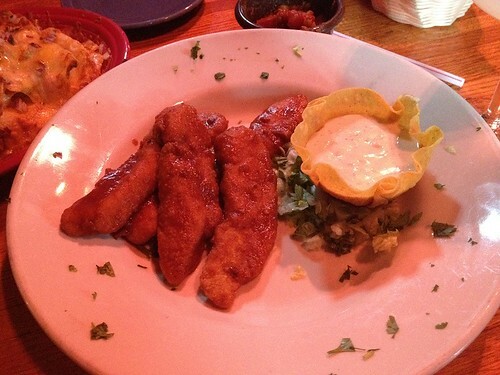 They are chicken fingers topped with a chipotle sauce. They tasted like something you could find at any chain restaurant. The crust had no crunch. The chipotle sauce was boring, not bad, but boring. There was no kick, no heat. 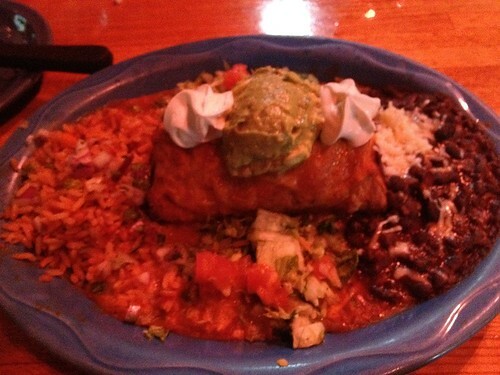 For a main course, I got the Chicken Chimichanga ($13.99). It came with black beans and rice, guacamole and sour cream on top. The rice and beans were pretty good. 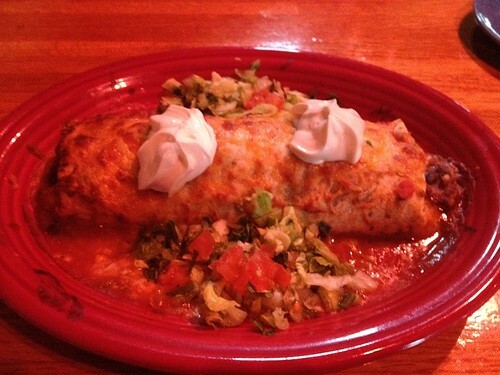 The chimichanga was boring. The chicken was plentiful and properly cooked, but it tasted as though it had not been seasoned. MG got the Beef Burrito Grande ($12.99) with a side of guacamole ($1.00). The beef inside was supposedly sirloin, but it definitely tasted like chuck. I won’t swear to it, I could be wrong. It was a little hard to tell since I think the beef was made without salt. Again, it was properly cooked, supplied in decent portion, but devoid of flavor.